The wonderful people at NPR have offered to share a full stream of Gorillaz’s new album Plastic Beach. Ah, who am I kidding it’s all promotional! Either way, the album should be promising. At its core, Gorillaz is the duo of Blur’s, Damon Albarn, and graphic artist, Jaime Hewlett, but has always consisted of a range of collaborators. Plastic Beach is no different. 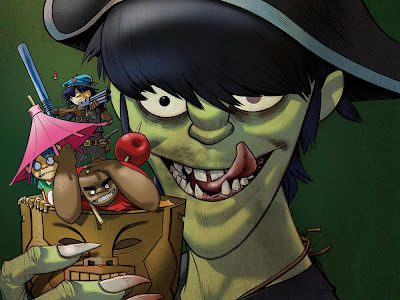 With appearances from Plastic Beach continues this trend, with Albarn bringing in an impressive roster of musical contributors: Snoop Dogg, Bobby Womack, Lou Reed, Mos Def, Super Furry Animals’ Gruff Rhys, Little Dragon, The Lebanese National Orchestra for Oriental Arabic Music, and many more.